At least one person has died while three of those injured have been rescued after a 7-story apartment building collapsed in Istanbul, Turkey. Dozens of people are feared dead, still trapped under the rubble. 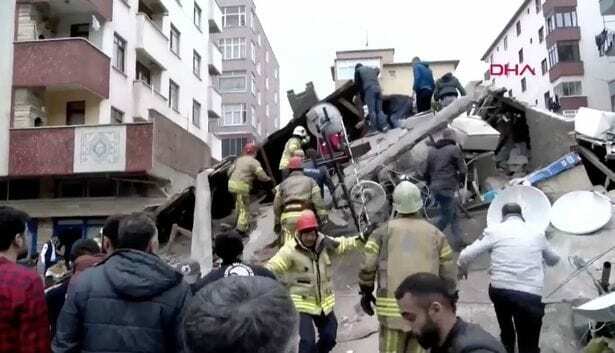 Emergency services were called to the scene of the collapse of the 7-story building in the city’s Kartal district after 16:00 local time. Eyewitnesses told local news station NTV that people were still trapped under the debris. At least one fatality has been recorded, while three of at least four people known to be trapped have been rescued. Footage from the scene shows rescue workers frantically trying to clear the rubble to reach potential survivors. Tiles, concrete blocks and wooden beams can been seen tossed across the street. Terrifying CCTV footage appears to have captured the moment of the collapse. It shows at least a dozen passers by running for their lives as the building crashes down in a pillar of smoke. Local official Zeki Dag told media that more than a dozen families were living in the block’s 24 apartments, and a further 15-20 employees worked in a textile factory located in the building’s basement. He added that no one was in the workshop at the time of the collapse. Istanbul governor Ali Yerlikaya said that a license to build a five-story block was granted in 1992, however, three further stories have been added illegally since then. He added that the basement factory was also operating without a business license. China does not have Arctic territories, and thus this kind of tourism is of special interest for Chinese tourists. PRAGUE, Czech Republic - Corinthia Hotels appoint Eric Pere as the new General Manager of its landmark hotel in Prague.